How would you describe your hands on your mat during down dog? Kittie Paws or Tiger Claws? I recently wrote and article explaining the reasons yoga teachers always ask students to smile during class and especially during difficult poses. I began realizing how often yoga teacher repeat the same things. In class this week, I noticed how some students become accustomed to hearing repetitive cues in class and become immune to hearing them. I gave the cue to spread the fingers and grip the mat pressing firmly into the finger pads of all 10 fingers. I noticed that not one student made and adjustment even though I have several students that complain of wrist pain in downward facing dog. I thought I would take the opportunity to explain this cue. 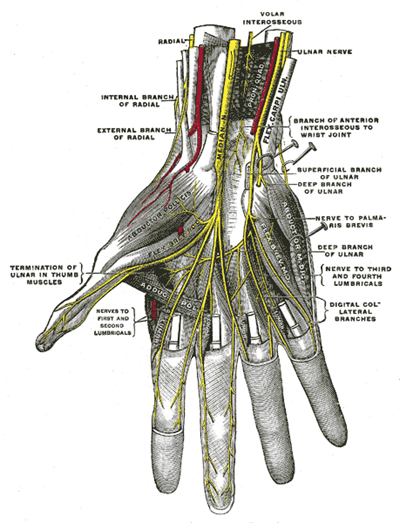 The vena comitans (veins accompanied by an artery) pass through the palmar superficial arch directly in front of the wrist. When the fingers are not engaged in downward facing dog, there is no support given to the wrist. By pressing the outside edge of the thumbs into the mat, the abductor pollics brevis and flexor pollics brevis muscle, which is the meaty part of the thumb that is responsible for the action of moving the thumb towards and away from the palm, engages. When these muscles engage, the fibers shorten creating a bulky protrusion on the inside edges of the palm. When the pinkie side edge of the hand is engaged the abductor digiti minimi and the flexor digit minimi brevis muscle engage and shorten and create a bulky protrusion on the outside edges of the palm. By engaging the first, middle and ring finger of the hand, the muscles in the forearm contract pulling against the palmaris longus and consequently the palmar aponeurosis. This muscle action creates an arch between the outside and inside edges of palm and relieving compression off of the median nerve and allowing blood flow to continue unimpeded into the hands and fingers. If your fingers are not spread, the palmaris longus cannot effectively engage the finger pads through the connection to the palmar aponeruosis, therefore, the palm of your hand will be completely flat on the floor. If you do not engage the muscles of the thumb and the pinkie side of the hand, there will be no arch where the palm meets the wrist, and you will be resting on the bony part of your wrist, while also compressing the medial nerve. This results in wrist pain in downward facing dog and other poses where weight is supported on the hands due to the compression of the medial nerve at the wrist and at the carpal tunnel. Symptoms overtime can include tingling, numbness and pain in the wrists and in the palm of the hand. Just like the feet, the hand has supporting arches. The hands have three supporting arches to be exact. The distal transverse arch creates a supporting arch between the knuckles of the first finger and the pinkie finger. 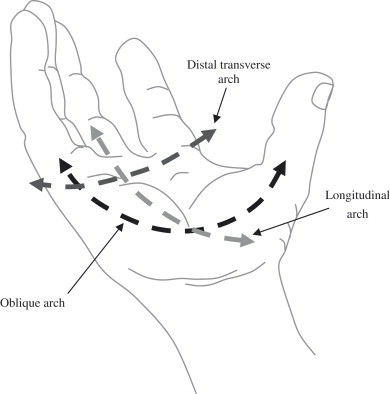 The longitudal arch creates a supporting arch between the knuckle of the middle finger and the center of the wrist. The oblique arch creates a supporting arch between the knuckle of the pinkie finger and the knuckle of the thumb. As we give the cue in yoga to lift your toes so that you maintain and protect the arches in your feet, we give the cue to grip or claw the mat to lift and support the arch in your hand to protect your wrist from compressing your medial nerve and your hand from compressing the carpal tunnel. 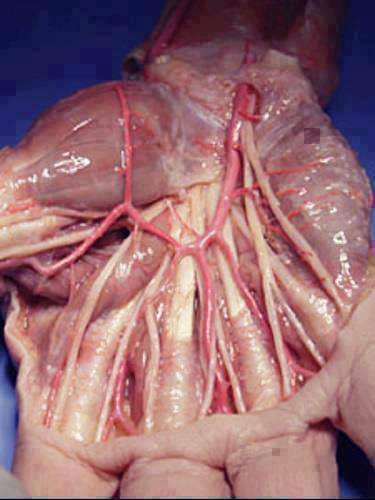 If you have a strong stomach and would like to see the cadaver view of the hand, Click Here. After realizing that many students become immune over time to repetitive cueing, I’m beginning to make familiarity with the science behind the cue part of my practice so I can have more to ‘encourage’ students with other than worn out axioms and repetitive commands. I’m definitely going to have to read this a few times to absorb it but great article!! Thanks. Just remember to keep the forearms engaged to support the arches of the hands so blood can flow freely and no nerves are being compressed. Should the palm of your hand be hollow, as in not touching the floor? I think my technique is flawed and i have wrist pain. Yes, in a sense, there should be a hollow area under the palm.